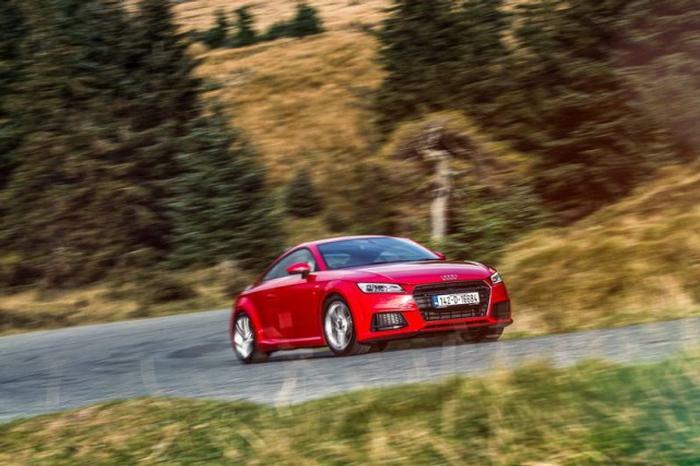 This is the Carzone.ie guide to buying a used Audi TT. With the launch of the third-generation TT in 2014, Audi promised to give its hugely desirable small coupe (first seen in 1998) the sort of dynamic prowess to go with its undoubted showroom glitz. With a typically high-quality Audi cabin – featuring the Virtual Cockpit digital instrument cluster as standard and climate control functions integrated into the centre air vents – and based on the Volkswagen Group’s MQB chassis, the TT Mk3 might not be quite as thrilling to drive as any Porsche, but it’s still good enough to turn every journey into a special event… and it looks as sharp as it ever has done. The TT Mk3 has been offered as either a Coupe or a Roadster, with a choice of front- or quattro four-wheel drive, manual or DSG twin-clutch gearboxes and in both petrol and diesel formats. Originally, only 2.0-litre, four-cylinder, turbocharged engines were provided, the TDI diesel producing 184hp and the TFSI 230hp. These were later joined by a 1.8-litre TFSI with 180hp, as well as a higher-powered derivative of the 2.0 TFSI for the first performance model, the 310hp TTS. This was later outstripped by the TT RS, which uses a 400hp 2.5-litre five-cylinder motor and which displays significantly enhanced exterior bodywork. However, both the TTS and the TT RS are very rare beasts in Ireland, given they’re expensive to run; indeed, the TT TDI Ultra (so-called because it uses only front-wheel drive and is good on fuel) is by far the most common model to find second-hand. In late 2018, the TT was mildly facelifted for 2019 and the 1.8-litre TFSI was dropped, in favour of two derivatives of the 2.0-litre TFSI with either 197- or 245hp, while the TTS was marginally de-rated to 306hp. Both of the facelifted ‘regular’ TTs took up Audi’s new two-digit, output-related model designations, meaning the 197hp version was badged as the 40 TFSI, while the 245hp model was named the 45 TFSI. The TTS (and, by extension, the TT RS) does not follow this pattern. As the most widespread example to be found on the used market, the TT TDI Ultra is the main choice, as it offers strong performance with frugal fuel economy. It comes as a manual and front-wheel drive only, and the Coupe body style suits its nature better than the Roadster. The Audi TT has always been a looker and the third-generation car is no exception. It also has by far the best cabin of any TT yet, while the choices of body style, gearbox, engine and traction make for a wide diversity of models to select from – if you can find them on the used market. The Coupe is a 2+2 (with very small rear seats) and so is slightly more practical, and it therefore makes sense to seek out the diesel Coupe for a stylish, enjoyable second-hand sports car purchase.